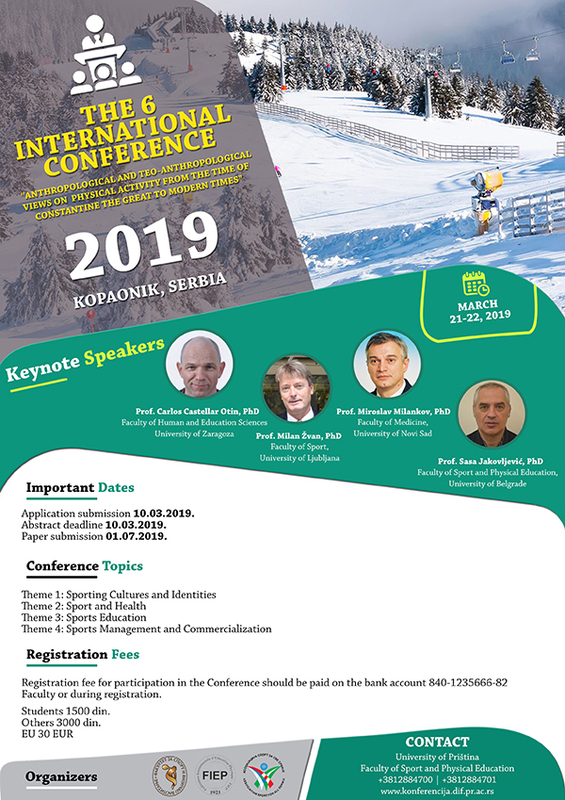 Guideliness for authors – INTERNATIONAL CONFERENCE "ANTHROPOLOGICAL AND TEO-ANTHROPOLOGICAL VIEWS ON PHYSICAL ACTIVITY FROM THE TIME OF CONSTANTINE THE GREAT TO MODERN TIMES"
ABSTRACTS should be sent to one page volume of up to 250 words with key words up to 5 terms, written in Serbian and English. Font: Cambria – 11, Page Layout: Letter; Margins: 2,5 cm on all sides. THE PAPERS should meet the following requirements: Volume: up to 8 pages of text, tables, images, graphs, references, and abstract written in Serbian and English. Font: Cambria – 11, Serbian Latin. Page Layout: Letter; Margins: 2,5 cm on all sides. The papers should follow the following structure: The title of the paper (in Serbian), the name of the author and co-author (affiliation), abstract in Serbian, 1. Introduction, 2. Materials and methods, 3. Results and discussion, 4. Conclusion and References (should be cited according to the APA standard. ): http://www.apa.org/journals/webref.html. At end of text should be given in the English language: the title of the paper, the name of the author and co-author (affiliation) and abstract.